Played hooky from blogging yesterday. Falling asleep and doing a faceplant into the keyboard is not a good thing. Self preservation above all. Busy days both yesterday and today. I was away from my computer so long that I lost my place in Facebook. My computer left a message for me that it was putting my face on a milk carton. I went to my first Chat and Mingle sponsored by the Photographers Adventure Club Friday night at the Cadillac Ranch in Tempe. I will tell you right now, I spent most of my time in Phoenix making it a point not to go east of I-17. I never lived more than 5 miles from where I worked. When I did travel to the east side, it was usually on a yellow school bus. I really hated it at the end of track season that we didn’t have enough people going to State to get a bus so I ended up driving the District’s prison van. When I looked up the address for the Cadillac Ranch, I realized that I had been to the Tempe Marketplace before and knew how to get there. Wrong. Needless to say I got lost. But I did have a good drive in and around Tempe and saw some nice things. Finally found the place and eventually was able to park in what has to be the most convoluted parking lot in the history of the world. Went upstairs to the Ranch. I had never been there before so I have to say I was quite surprised when I ordered a Coke and the waitress asked for my debit card and my driver’s license. I almost left the Ranch at that moment. I get a bit testy at restaurants when I think they are doing something absurd. The waitress was asking me to violate every rule of caution that I read should be done to protect against identity theft. But I thought, well, Poole, you are meeting most everyone for the first time, it would be bad form to tip over the table and throw a chair against the wall and leave in a huff. They might not invite you back. So I relented and did as required. As we discussed this during the evening, we figured it was because there was a huge number of college kids that patronized the place. So I don’t blame them for coming up with that practice. But I overcame my getting lost in Tempe and anxiety over identity theft and relaxed and had a great time. Met and mingled with Sharon, Christine, Ash, Lisa, Les and the organizer for the night Evy. Christine, Sharon and Ash were especially helpful with some technical questions I had, although they found out they had too speak very slowly and use small words so I could understand. Christine shared her underwater photographs that she takes. Everybody was showing their new I-phones. Since I only have a Blackberry, I kept it hidden under the table when I checked it. I am always a bit nervous when I meet new people in strange settings, but I think Evy was more apprehensive than me. Although she knew everyone else pretty well from other meet ups and shoots, this was her first time being the organizer for the Meet and Mingle. She really wanted it to go off well. And it did. She was a splendid hostess, talking with everyone and making me feel very welcomed and right at home like I had been with the group forever. I really appreciated it. I am looking forward to the next M&M that is offered. Photograph by Sharon Joubert on her I Phone. 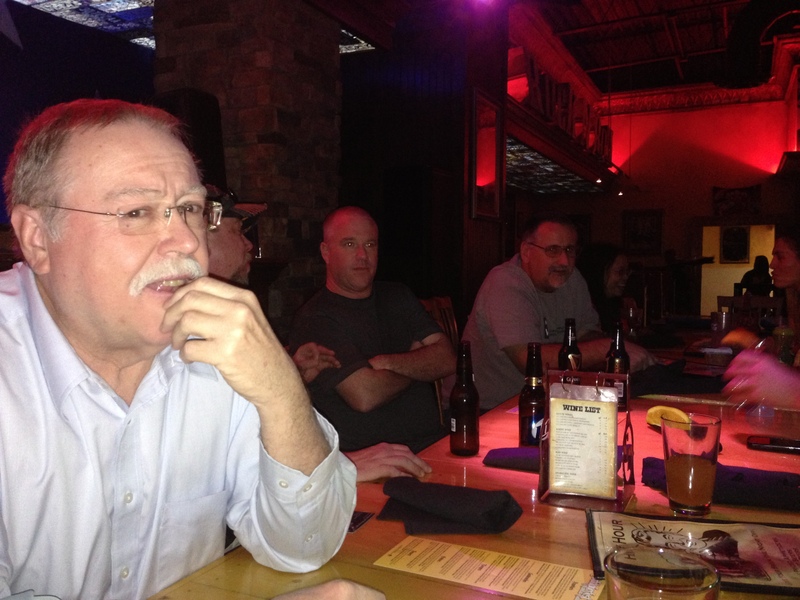 Me doing what I normally do… smiling and nodding my head knowingly. Plus working on my raising one eyebrow only skills. Saturday was filled with more photographic activities. 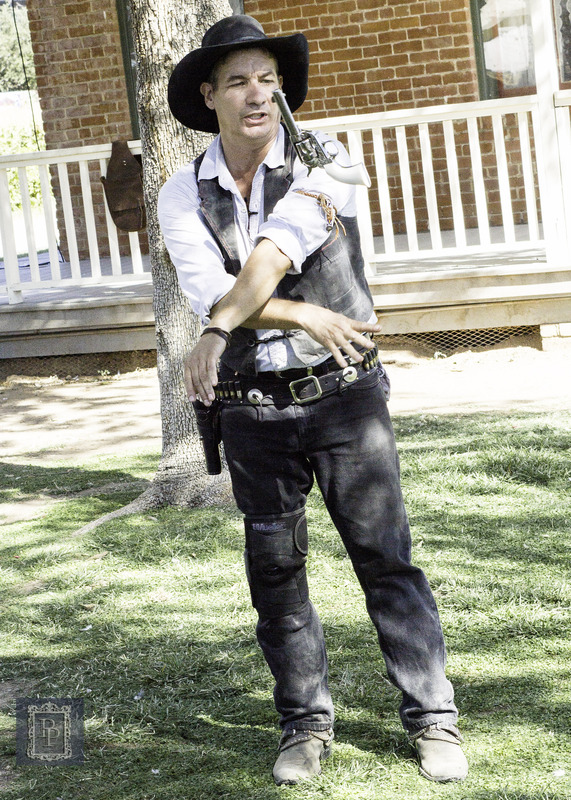 Although many of the group went up to Oak Creek to do some shooting, I went to the Wild West Festival and Sahuaro Ranch Park. This is my second attempt at shooting an event at Sahuaro Ranch Park, the first one being a folk and bluegrass music festival. Sahuaro Ranch Park is a dry and dusty place. It just doesn’t inspire me to shoot pictures there. I don’t know if that happens to other photographers. I was very hard pressed to choose the few photographs I kept. I read every book I can about the famous Gunfight at the OK Corral. I have seen all the movies about the event. (I find it amazing that John Ford personally knew Wyatt Earp and had the first hand account of what actually happened that day, and yet his movie about it bears no resemblance to what actually happened.) Yet with all this interest in the event, I have yet to go down and visit Tombstone. Perhaps I should put that on my bucket list, if I had a bucket list. Tombstone was the best, probably the most historically correct, version. My one pet peeve with Hollywood is that they never seem to get actors close to the age of the participants. Wyatt Earp was 33, Doc Holiday was only 30 and Josie was a mere 20 years old at the time of the gunfight. At the time of shooting Tombstone Kurt Russell (Wyatt) was 42, Val Kilmer (Doc) was 34, and Dana Delany (Josie) was 38. The WWF had a gunslinging contest. This prompted me to think about the most famous gunfight ever. As you see in the photo, the shooters start out in this strange looking leaning backward position. 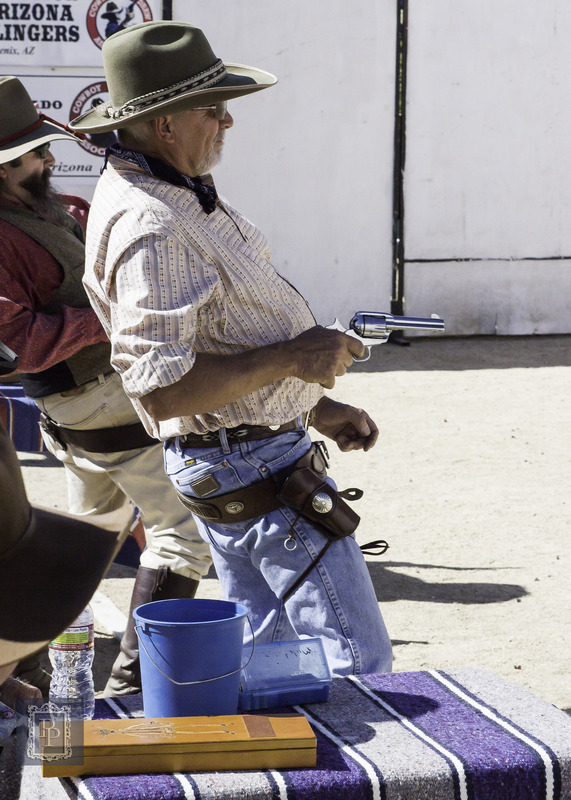 I do not think that the Earps, Holiday, Clantons and McClaurey’s started out in this weird looking layback position. But maybe they should have. The gunfight lasted 30 seconds with about 30 shots fired. They participants were only 6-10 feet apart. Only 7 bullets hit their target! I saw a few posts on Facebook about something called GANGNAM STYLE. Always wanting to be on the cutting edge of what’s going on, I searched YouTube so I would know what was being talked about. I cannot properly do it justice attempting to describe the Gangnam dance style. I suggest if you haven’t seen the PSY video you should check it out. That is the only way this picture and caption will make any sense to you. This performer was waiting for his show to start (they were 45 minutes ahead of schedule) so he just did a few teasers for the crowd while they were waiting. One final thought. I now have a reason to regret retiring when I did. When researching GANGNAM STYLE, I found their were a plethora of video parodies using the song, ranging from the mom and son on the Ellen DeGeneres show, to the USNR spirit team as well as the North Korean army. I could have showed a new video everyday in class. I am sure the students would have liked them better than Hell March or William Shatner’s Rocket Man. The Gunfight at OK Corral by Frankie Laine, from the 1957 movie of the same name.